Peptides are naturally occurring amino acids, which are building blocks of the protein collagen. Therefore, they are a common ingredient in anti-aging products for the skin. 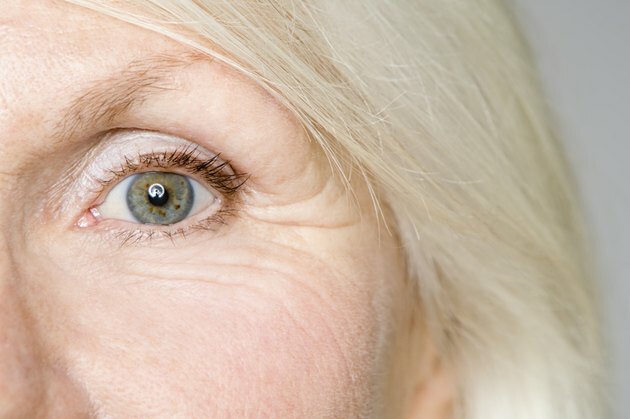 Although your skin contains an abundance of collagen when you are young, the supply decreases as you age, which is why the it begins to appear thinner and more wrinkled. Lab-engineered peptides have shown promise as a skin cream ingredient that can stimulate skin growth and repair. As you mature, your skin begins to lose its powers of regeneration. It may be possible to stimulate new collagen growth and help skin heal through use of pentapeptides, which contain a lipopeptide -- fatty acid -- in combination with five amino acids. One pentapeptide, palmitoyl pentapeptide-3, is trademarked under the name Matrixyl. This peptide is included in wrinkle creams as a means of stimulating the lower layers of skin, prompting it to release collagen and hyaluronic acid, skin healers which freely occur in the skin of a younger person. Although further independent research is required to prove its efficacy, one study carried out by an ingredient manufacturer showed that palmitoyl pentapeptide worked better than a product with vitamin C or retinol. Hexapeptides are chains of six amino acids. A specific hexapeptide coupled with acetic acid, acetyl hexapeptide-3, is marketed for its supposed ability to relax certain types of facial wrinkles. Some wrinkle cream manufacturers say this peptide is capable of diminishing the creasing caused by fine lines, delivering an effect similar that gained by botulinum, or Botox, injections. Advantages of acetyl hexapeptide-3 over Botox treatment are that it is noninvasive and can be applied everywhere on the face. This peptide molecule is trademarked under the name Argireline. Palmitoyl oligopeptide, like palmitoyl tetrapeptide-7, promotes production of collagen and hyaluronic acid in the deepest layers of skin. This substance has an additional quality that makes it a valuable ingredient in face creams -- it also helps protect the skin from the damaging ultraviolet rays of the sun. Although an application of palmitoyl oligopeptides does not replace a good quality sunscreen, it can help add another layer of protection to delicate facial skin. Palmitoyl tetrapeptide-7, once called palmitoyl tetrapeptide-3, consists of a chain of four amino acids coupled with palmitic acid, a fatty acid which allows for the peptides to penetrate the skin. This peptide may be useful in fighting inflammation, the ultimate culprit behind aging skin’s loss of elasticity and development of wrinkles. It is possible that palmitoyl tetrapeptide-7 not only reduces the production of inflammation-producing substances but might also act to stimulate skin regeneration. Copper peptides, small fragments of proteins combined with copper, can enhance skin regeneration and the healing of wounds. They are included in many anti-aging products for their ability to increase skin elasticity and firmness. Because copper is a toxic metal, avoid using it on the skin in any form except those that contain peptides that bind with the metal, warns the University of Maryland Medical Center. What Is Caprylic/Capric Triglyceride in Face Cream?